Replace the natural lip fullness that time has taken away. Plump and accentuate the lips with a balanced, harmonising approach. Our safe dermal filler injections have been used all over the world for more patients than any other. You’ll notice the results straight away – and they will last 10-18 months. Forget the duck-faced extreme pouts of times gone by; our results are subtle and natural. Lip injections don’t have to hurt! Our special topical anaesthetic and vibration therapy ensures you remain comfortable and relaxed during your treatment. Don’t despair if you’ve had a lip filler treatment elsewhere and aren’t happy with your results; we can dissolve your filler and provide a blank canvas to build your ideal lip shape. Under the medical guidance of specialist plastic surgeon Dr Sharp, our caring team of clinicians use only the best quality dermal filler products for a long lasting, naturally beautiful result. Your treatment will begin with a full facial assessment to help you choose the best lip ‘style’ to compliment your facial features. You will be advised up front of costs involved, and we will tailor your treatment to suit your budget. Then our special topical anaesthetic cream will be applied to your lips to ensure the treatment is comfortable, with the added benefit of vibration therapy used during the injections - so all you have to do is sit back and relax as your clinician goes to work, crafting your beautiful new lips. Our skilled team also specialises in dissolving unwanted injectable product, giving you a blank canvas to build your fresh pout. How do lip injections work? As we age, our lips become lined, thin and lose volume and definition. This can cause a flattening of our facial profile, asymmetry or facial imbalance - often creating the appearance of a terse, tense or downturned mouth. Lip injections are comprised of a naturally-occuring dermal filler gel that attracts water when injected under the skin. 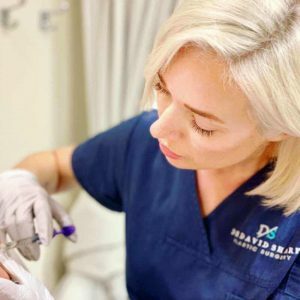 Through strategic placement of the filler product under the skin with a fine needle, the filler attracts fluid from the surrounding tissues and swells, plumping the lip while defining the vermillion boarder and, if required, subtly filling deeper wrinkles around the mouth’s vermillion boarder. The philtral columns that run vertically between the nose and top lip can also be slightly enhanced, and the ‘cupids bow’ in the middle of the top lip redefined, restoring the upper lip’s natural shape and projection. Your first consult will include a complimentary facial assessment to determine the best treatment approach for you, so the initial appointment will take about 45 minutes. Thereafter, your maintenance visits will take approximately 20 minutes. 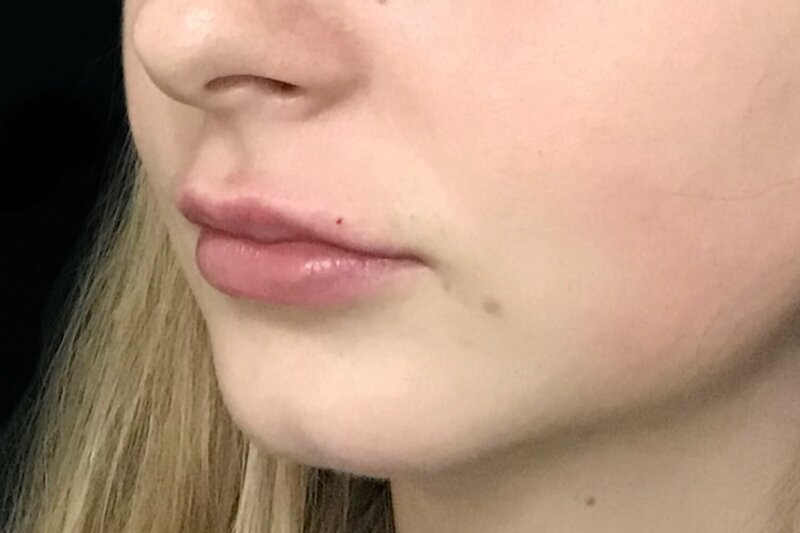 What will happen during my lip injection consultation? Your clinician will examine your face and lips, as well as your overall facial features and symmetry. They will discuss your perception of your face and lips, and your desired outcome from the treatment. You will also be informed of the potential side effects and complications of cosmetic lip injections, and your post care instructions. You’ll receive an estimate of the amount of the product that is required to create an ideal result. Before your treatment, photos will be taken and your lip area will be cleaned with alcohol. You will also be offered topical anaesthetic, which can be placed on the lips to decrease sensation. The injections themselves take 5 to 10 minutes. If this is your first treatment, a review appointment will be booked in 2 to 3 weeks to assess your results and see if any adjustments need to be made; this won’t be required for subsequent treatments. How much do lip injections cost? Prices start from $499 and customised estimates are available upon request (click the contact button above or email info@drdavidsharp.com.au). How long until I see my lip enhancement results? Results are instant - however swelling may mask your results, so it’s important to be patient and wait for the swelling to subside before you can assess your final outcome. How long will lip injections last? Results will last around 12 months. There is no clinical need to rest or have time off work after the injections, and you will be able to return back to normal activities straight afterwards. However your lips may look swollen and bruised for several days after the treatment, so it is good to keep this in mind if you don’t want others to be aware you have had the injections. Are there any post treatment precautions I should be aware of? During your consult your clinician will explain your post treatment care instructions, and you will also take home a written post care sheet. You may be encouraged to gently massage the treated area in the days following the treatment. It isn’t advisable to wear make up over the injection sites or have dental treatments for 24 hours. It’s important to follow your clinician’s advice and also read your take-home post treatment care instructions carefully. Are there any side effects of cosmetic lip injections? Dermal filler lip injections are very safe. The most common side effect is local bruising and swelling around the injection site. Less common, but possible, side effects can be infection or local allergic reaction. Infection can occur immediately or some weeks (or uncommonly, months) after the injection. Symptoms include redness, localised heat, tenderness, swelling and pain - with or without lumps. It is important to contact us if you experience these symptoms after your treatment. It is normal for your lips to feel lumpy and bumpy for the first few weeks. This usually resolves, and can be assessed at your review visit. If necessary, any asymmetry can be ‘tweaked’ to adjust the amount of product placed. This is one of the factors our clinicians take into account when treating patients. We would always prefer to under-treat initially, and then add more once your initial results are evident, than to over-treat in your first visit and create an over-injected, undesirable appearance simply just to sell a higher volume of product! How often will I need maintenance treatments? The longevity of results can vary from patient to patient, but generally most patients have their treatments every 10 to 18 months to maintain their results. Fortunately, the high quality modern dermal fillers we use are infused with local anaesthetic, so as the product is injected, it also simultaneously numbs the area. This makes the treatment much more comfortable than lip injections have been in the past. We use the smallest possible needles to deliver your treatment, and most people find it very tolerable. If you are concerned about discomfort, please ask us to book you in for pre-treatment topical anaesthetic. See below for more details. What is the 'ideal' lip shape? There is no one ‘ideal’ lip shape that is right for every face. The perfect lip shape for you will depend upon a plethora of factors, including your unique facial features, face shape and existing lip shape. To see how individual lip beauty can be, observe the archetypal ‘beautiful’ lips of Hollywood - Michelle Pfieffer, Angelina Jolie and Grace Kelly all have totally different lips that are beautiful for different reasons. 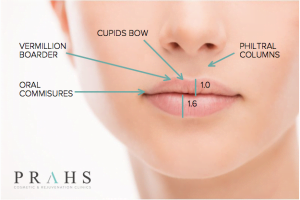 Generally, a defined cupids bow, slightly upturned oral commissures, soft fullness in the middle of the lips and a slightly larger lower lip are deemed desirable. For thousands of years, humans have been fascinated by the concept of ‘Divine Proportion’ or the ‘Golden Ratio’ which deems ideal proportions to be 1:1.62 (also known as Phi in mathmatics). This ratio is nature’s symmetry and occurs naturally in life. The premise behind this is that the closer a face or object is to the golden number 1.62, the more beautiful it becomes. Even though they are not usually measured down to the millimetre to achieve this, most injecting techniques aim to achieve symmetry and harmony based on this principle. Can dermal fillers also be used in the face? Yes, dermal fillers are also commonly used on the mid face to replace lost upper cheek volume and reduce nasolabial folds, restoring natural, healthy facial curves - or sometimes in the upper face to address temporal hollowing, nose irregularities or to soften the appearance of protruding bony prominences around the brows. Can lip injections be used alongside cosmetic lip tattooing? When paired together, cosmetic lip tattooing and lip injections are a powerful combination of treatments to achieve visible, long lasting lip enhancement. Not only does this combination of treatments define the lips, it also helps to correct asymmetry. 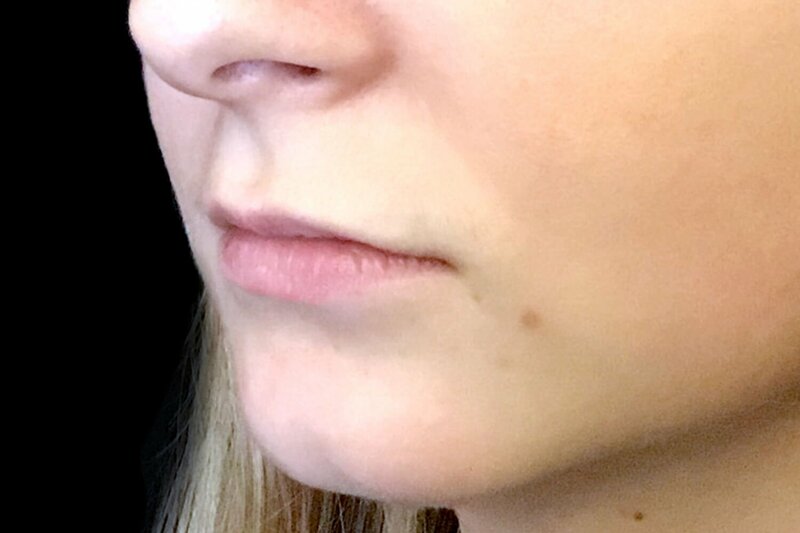 Are lip injections used to fill scars from previous surgery on the lips? Yes, dermal fillers can be an effective way to restore lost tissue or disguise old scars on and around the lip area. Lip deformities caused by skin cancer or trauma surgery can cause a loss of volume and asymmetry. Carefully-placed, small amounts of lip filler can help restore what cancer or trauma surgery has taken away. Does your clinic offer anaesthetic cream to numb the area prior to treatment? Most patients find the injections are so quick and tolerable, they don’t require any topical anaesthetic - however we are more than happy to apply our prescriptive topical anaesthetic if requested. Please let us know if you would like this when booking your consultation, so we can schedule you to come into the clinic 30 minutes prior to your consultation, allowing plenty of time to apply the anaesthetic and for it to take effect before your treatment.